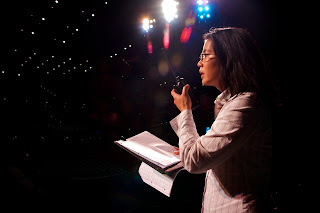 Assistant lighting designer Connie Yun spoke to me recently about her plans for Seattle Opera’s upcoming productions, what she does to “replenish the visual fire,” and what lighting and poetry have in common. How did you find your way to lighting for opera? I studied violin as a child for nine years, and my violin teacher gave me tickets to go see Les Troyens at the Met. It was a little intense for a 10- or 11-year-old, but it was amazing to see a production of that scale and that kind of musicality. That production was always in the back of my mind. I started with technical theater in high school, and then when I was in college, I was accepted into the apprenticeship program at the Santa Fe Opera, which was pivotal for me as far as working on that scale and working in opera. I caught the bug. Do you rely on your musical background when you’re lighting a show? There’s no ques­tion that having some musical knowledge is extremely helpful. Timing and a sense of musicality plays heavily in pretty much all lighting compositions. For any show, you really do have to know the music, and your ideas need to evolve with how the specific conductor is interpreting that music. In general, once we get to the stage and begin to build lighting cues with the director, we try to work with a recording of the rehearsals so that we can time out lighting shifts with the maestro’s pacing. You’ll be the head lighting designer for both Attila and Orphée et Eurydice. What should we expect? For Orphée we’re probably going to rely more on dance-style lighting because there are dancers in the piece. I am hoping to use more boom and ladder posi­tions, which will allow more light and shadow contrast to accentuate the body, versus overhead lights, which tend to foreshorten the human form. Think about how different the leaves from trees can look at sunrise and sunset versus at high noon. The angle of lighting can create a greater sense of dimensionality and detail. For Attila, the process is a little different since we’re working with an existing set, but that hasn’t stopped us from making some changes to that design, the biggest change being the addi­tion of projections to help illustrate location and also emotional states. For me, it’s a nice con­trast to Orphée, which I expect to draw a lot of inspiration from nature or manipulated nature (à la artist Andy Goldsworthy). Attila will be much more about the ugly side of humanity: power, politics, decay, hubris. What that means lighting-wise will be a fun exploration! Are projections really affecting what you do? They are. This is an exciting time for new technology, and we’re lucky to be able to work with it so extensively. When you’re not the lead lighting designer, you’re the company’s assistant lighting designer. What does this role involve? As the assistant lighting designer I am the liaison between the company and any guest lighting designers. Since I’m familiar with the hall and the personnel, I can help guide choices that most effectively allow the designers to create the visual look that they want. Could you give examples of two different lighting styles? Bluebeard’s Castle was fun for us because it involved very old-school lighting tricks. The door that opens to the gold, for instance, was basically light bouncing off Mylar strips that one of our stagehands was holding and waving so that it would have a shimmering quality. In Don Quixote, the set didn’t change, but by moving it around, we were able to light each scene uniquely and transform it into a town square or the mountains or the windmills. There’s an amazing amount that we can achieve in lighting, and it doesn’t always have to be in-your-face. It can be subtle and still make a huge impact, even if the audience isn’t necessarily aware of it. Do you do lighting design outside of opera? I do. I just did a dance piece in April for Catherine Cabeen at On the Boards. Things that keep me outside. Part of what keeps me engaged in lighting is to see as many things as possible, so I love to go hiking and camping. In 2008, my husband and I went hiking all across the Southwest for seven weeks to replenish the visual fire. Anything else you’d want your audience to notice? Honestly, I don’t want to call out too much attention to what I do. I like that this art form has a fleeting quality and you can’t pin it down and or break it down into why it worked so well. In a weird way it’s almost like poetry—it can draw you into a really elusive, sensory memory. I hope people feel that. But I hope they don’t spend too much time trying to analyze it. This Staff Chat first appeared in Seattle Opera’s program for Attila in January 2012.